Adam Van Zee '07 is very familiar with tennis in the North Coast Athletic Conference. The three-time captain and 2007 All-NCAC doubles player will take over as the head men's and women's tennis coach at Earlham College. Van Zee is tied for second in career doubles victories at Wabash with 54. His 23 doubles wins as a senior with partner Jay Horrey set the school season record. Van Zee is currently pursuing a masters degree in sport and exercise psychology at Ball State University. A psychology major at Wabash, Van Zee was also a member of Delta Tau Delta fraternity. 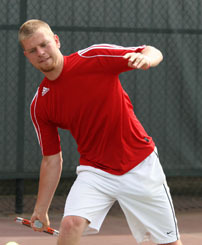 "Adam is very knowledgeable about the game of tennis," Wabash head coach Jason Hutchison said. "As a captain at Wabash, he served as an assistant coach for me. He also knows the high school tennis coaches and programs around the state of Indiana. Adam will do a tremendous job at Earlham, just as he did as a member of the Wabash tennis team." Van Zee begins his duties at Earlham immediately.